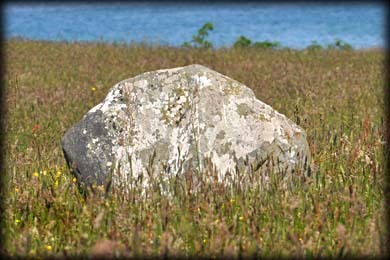 This stone is located on Murrisk Demesne in the first field west of the National Famine Memorial at Murrisk. The stone stands approximately 1.35 metres high by 1.5 metres at it widest point. The best time to view the complete megalith is probably during the winter months. This is one of three stones at Murrisk Demesne. The other two are in the adjacent field west of this one. The three stones are not in alignment. About 3 kilometres east of here is the splendid megalithic complex at Killadangan. 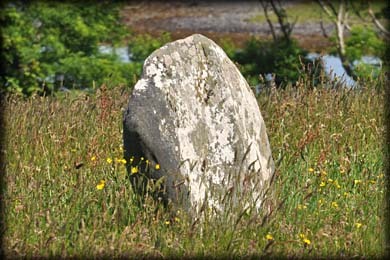 Situated: The stone is located on the opposite side of the road to the Croagh Patrick car-park in Murrisk. Walk west from the famine memorial. Discovery Map 30: L 9175 8249. Last visit June 2014.